Voted The Best Wild West Reenactment group this side of the Mississippi!!! A very enthusiastic two thumbs up! The Law of the old west was the law of the gun. You either drew faster and shot straighter or you died tryin'. 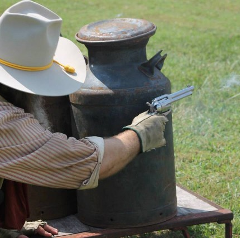 Cowboy Posse Productions is a group of Old West reenactors who have come together to recreate some of the most famous and not-so-famous gunfights of the Old American West. If you're looking for the best in Wild West Entertainment, you need look no further. We strive to be authentic in every aspect of the times and the culture we reenact. From our clothing and boots to the firearms and gun belts of the time. Realism is just a part of the experience you will enjoy, but the acting and scenarios played out for your event is the dynamic that brings it all home. Your guests will leave with a memory to last a lifetime. Get ready for the greatest Wild West experience of your life! we adhere to the very highest of safety standards while providing the dynamic show your event demands. Welcome to Cowboy Posse Productions! 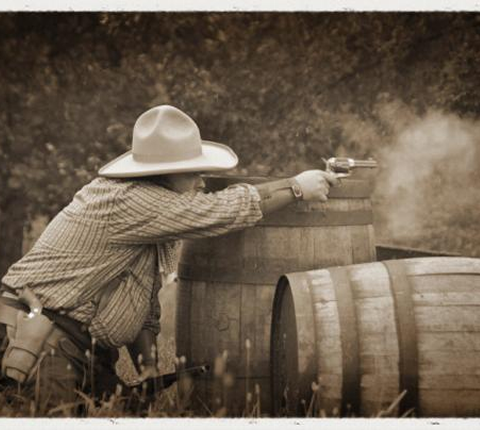 At Cowboy Posse Productions we take pride in providing late 1800's era cowboy reenactment scenarios, from the "Shootout at the OK Corral" to Jesse James and the Dalton's, to highly imaginative originally crafted story lines. 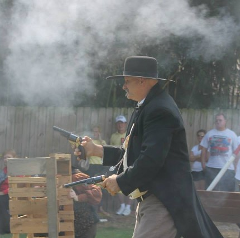 We are a Christian organization dedicated to authentic era reenactments and Wild West entertainment that is suitable for the entire family. Our members are a diverse group of individuals with a wide range of skills and talents whose only goal is to make your event stand up and stand out. We can help take your Festival or Community event to the next level by putting the "Bang" into it! Interested in reenacting? We're also lookin' for Men and Ladies who would like to participate in reenacting or are interested in joining our group. If that might be you call Eddie Kinberger at (502) 553-3696 and find out how to get involved. Preserving History and having a lot of fun doing it! Booking for 2019 Season is filling up quick, don't wait, Call Today!